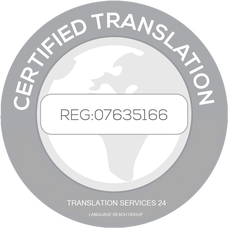 Translation Services 24 offer official and legally certified passport translations in over 200 languages from every corner of the world. We understand that translating your passport might be a legal requirement in a number of urgent circumstances and something that you might often not foresee. Therefore, as experts in passport translations we ensure that the complete process is as straightforward and fast as possible and can be simply done online within just 2 working days. Due to it’s importance, when required to do so, translating your passport must be conducted accurately and reliably by a fully qualified and registered translation agency so that the translation can be officially certified and consequently recognised by official institutions such as Courts of Law or the Home Office. Here, at Translation Services 24, we only work with linguists who are not only native speakers of the target language, but who are also hold a language degree and are officially registered. As a result, all of our translations are formally certified with a statement of truth, stamp and a signature – making the translation of your passport acceptable by the legal institutions. How long will it take to translate my passport? Translating and certifying your passport with us will usually take around 2 working days. In some urgent cases however, we may be able to turnaround the translation and certification of your document within the same day! Standard price for translating your passport will be £45 + VAT. This includes translation, official certification and a UK delivery via first class mail. We will also deliver an e-version of your translated and certified passport to your email address. How to translate my passport? To translate your passport with TS24, simply email a scanned copy (or a high quality picture) over to info@translationservices24.com and we will get back to you with an official quote. If you then wish to go ahead with the translation, you will be able to simply pay the invoice online, using PayPal. Alternatively, you can attach your documents and send them over to us using one of the contact forms available on our website.